Fusion Custom Travel Mug & Tumbler 16 oz. 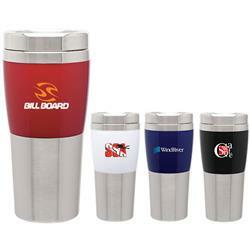 The Fusion Custom Travel Mug with your promotional logo. This beautiful mug is a composite of acrylic and stainless. A very high perceived value gift, this retails from $10-$15 each. With a minimum order of 72 pieces, you can travel in style with the 16 oz 2-tone acrylic and 18/8 stainless steel tumbler with a push-on lid, and foam insulated to keep your favorite beverage hot for hours. A great way to advertise your logo while you commute! Comes with a free gift box. Too many tumblers to choose from? Call our staff at Adco Marketing for help. On special now at 144 pieces. Available Colors: Blue, red, black, and white. RUSH PRODUCTION AVAILABLE ? INQUIRE! Typical Imprint Area(s): imprint area H x W x Wrap 2 x 3 x 9. Available Imprint Options: Second color imprint add $.75 each. 16 oz 2-tone acrylic & stainless steel tumbler, foam insulated. Individual white gift box included. 24 per case at 19 lbs.